This recipe is based on the PB&J Cinnamon Rolls, by Runs with Spatulas, featured at Number 18 on BuzzFeed’s 29 Ways to Honor the Glory of Peanut Butter and Jelly. I love bread. I love cinnamon rolls. I love peanut butter and jelly. It only makes sense to bring those loves together. A word (or 67) about PB2 peanut butter powder. This product has popped up now and again during my MoFo. If you haven’t tried it and you’re curious, you can read my review of it here. It’s a great thing to have in the cupboard – good in smoothies, in baked goods, or as a lower fat alternative to peanut butter (just add water and stir). I shared this at the Virtual Vegan Linky Potluck 13. 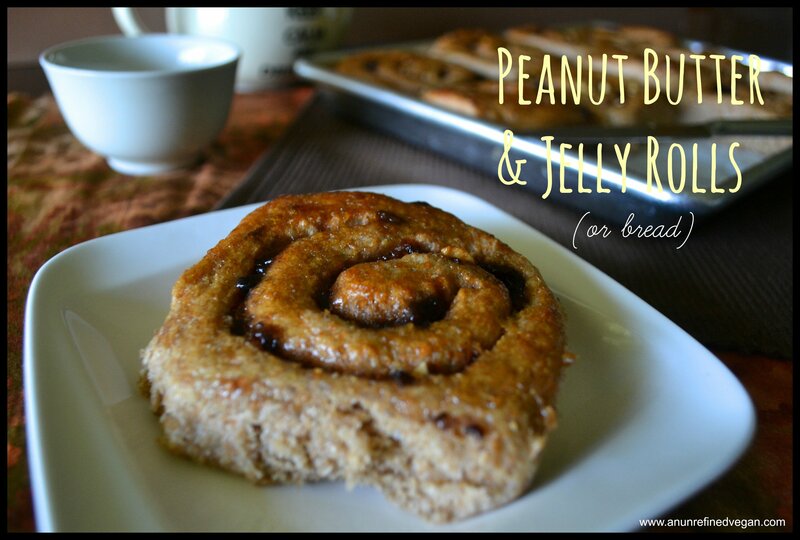 Cinnamon rolls are awesome, right – but peanut butter and jelly rolls? That’s what I’m talking about! This vegan recipe yields 2 pans of rolls or 2 loaves of bread. In a large bowl, combine the yeast with the warm water, warm milk and maple syrup. Let sit until foamy and then add the salt, peanut butter and 3 cups total of flour (a combination of the AP and whole wheat flours). Stir until very well-combined, then add 1 more cup of flour – stir again – and then cover and let sit to rise for about 1 hour or until doubled in size. Punch down the dough and add the flaxseed meal mixture and the PB2 powder. Begin stirring/kneading in whole wheat flour as needed to bring the dough to a slightly sticky consistency. Knead for about 10 minutes and transfer to an oiled bowl, cover and let rise for another hour or so. Preheat the oven to 350-degrees and lightly coat 2 bread pans (or 1 bread pan and one quarter baking sheet) with oil and set aside. Divide the dough into two and roll out to a rectangle – I don’t know, maybe 6″ x 12″. Spread half of the jam (5 oz.) over the dough and sprinkle with cinnamon and half of the chopped peanuts. Carefully roll the dough and place in one of the prepared loaf pans. If you’re making rolls, repeat this process except cut the roll/log (I use dental floss – doesn’t crush the delicate rolls) into 12 slices. Place slices in prepared quarter baking sheet. In a small, microwave-safe bowl, melt the coconut oil and the 1 tablespoon jam, whisk and then gently brush over the rolls. Bake the rolls and loaves for about 30-35 minutes. The loaf should sound hollow when tapped on the bottom and the rolls should be shiny and deep brown. About 10 minutes before the baking time is up, I usually remove the loaf from the pan and return it to the oven to sit directly on the oven rack. This assures a nice crust on the bottom. Let bread cool completely before cutting and serving – though you’ll probably want to eat the rolls while still warm. Me too and even better with pbj ! I’ve picked up a jar of PB2 twice before, read the jar and put it back on the shelf. i think next time its going in the cart! These look so scrumptious and gooey right? Nothing better than bread and fruit. The classic, just reconfigured! I think you’ll like dried peanut butter, Angela – I know you’ll come up with all kinds of delicious ways to use it. It’s all in the wrist, girl :-). PS just don’t add it to the dough – – it messes up the rise. I never picked up any PB2 before since I never knew what to use it for, it seems I need to go back to the store. These look mouthwatering! Thanks! It’s kind of a fun product to have in the pantry. Haha! Gosh, you brought me back to my childhood with that one! I’m loving your theme, Annie, and this is the best post yet. So Yum! Thanks, Kristy! Between you and me, my favorite MoFo recipes are all happening this week :-). I just made a peanut butter & jelly cashew cheesecake and instantly thought of you!! You are so good at bread! Those rolls look so incredibly moreish, I’d want to pull one off and chew my way through it hot straight out of the oven. The loaf looks ridiculously good too, and I don’t know why but it makes me think of Boxing Day and what I’d want to eat after noshing a lot the day before. Thank you very much, Gaby! It means a lot to me that people carve out some of their time to spend on my blog. Amazingly even after all of my PB&J posts, I still LOVE the stuff! It’s just a good, classic combination of flavors. As for the bread…I’ve had zero luck making GF loaves (cookies, pancakes, brownies – no problem) so I’m the worst to ask! One thing you could do is try a pre-made mix (here’s a link to six different ones: http://breadbaking.about.com/od/reviewsandrecommendations/tp/gfbreadmix.htm) and add a dollop of nut butter to the ingredients. Or you might check out my friend Richa’s beautiful blog. This sandwich loaf sounds amazing: http://www.veganricha.com/2013/06/gluten-free-strawberry-sandwich-bread.html and would be perfect with peanut butter!